Scenario: You pull up to the ski lodge, your car having deftly carved its way up the mountain passes though precipitation in every frozen form. Oh yes, you’re in for a great weekend of not breaking your ankles with your new snowboard. But as you awkwardly wrestle your board out of your trunk, and back seat, and front seats, you realize that all the other cars have their boards in those sweet snowboard carriers. On the porch, the man or woman who would have been your spouse just shakes his or her head and walks away. No, you don’t shatter your ankles, but your life has been ruined, all because you thought roof racks were too complicated and hard to install. DON’T LET IT HAPPEN TO YOU. Just check out our quick guide to putting together your Yakima roof rack system in three simple stages. So maybe our scenario is a little extreme, but Yakima roof racks really aren’t as complicated as they can first seem. There are a few configurations to figure out, but that’s because every car model has a different roof. And the rewards are worth a little assembly. Roof racks make it easy and secure for you to haul your stuff. They keep your hitch free for trailers. But most of all, they just look awesome. Here’s how they work. Start with your towers. These are the support structures at each corner of your roof rack system. A tower extends from the roof of your car to the crossbar of your rack. The most popular and versatile towers are Yakima Q Towers. Yakima have been building this system since 1995 and they haven’t slowed down, because Q Towers are brilliant. Remember how every car roof is different? Q Towers are just about the same all around. The tower sits, padded, against your roof, and a non-scratching Q Clip extends down to hook on your rain gutter or door frame. But say you want to switch your rack between cars. Just use a different Q Clip. All Q Clips fit into Q Towers. They’re really just adapters. Q Towers also have a high resale value, because they’re so universal. A tower system designed in 1995, however, is bound to look a little less than sleek. If you’re willing to put in a little more install time, and you’re looking for a lower profile, more simplified style, Yakima’s Control Tower system bolts directly into your factory roof rack ports. These are great if your car came with a factory rack that you pulled off because it looked stupid. But if it didn’t look stupid and it’s still on there, all you need is a small tower to attach your lengthwise rails to a pair of crosswise bars. Yakima’s RailGrab towers…well, they grab onto the rails. These are the round tubes that run across your roof from tower to tower.. Well, they’re mostly round. 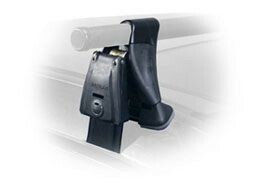 The oval bars, such as the specialized Whispbar, use their own built-in towers. 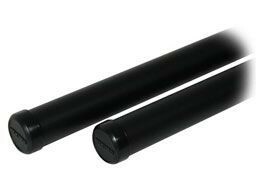 Crossbars are generally vinyl-coated pipe, lightweight, grippy, and rust-proof. They come in several lengths and clamp directly into the towers. In case you were wondering what would ever keep a Q Tower from flying off of your car, it’s another Q Tower, connected with a crossbar. On its own, a Q Tower doesn’t have enough grip to hold on, but pair it up with another one and you’re solid. This is where you can add a fairing, that cool looking black wing on the front of the other racks you’ve seen. A fairing improves aerodynamics and reduces wind noise. And it looks awesome. Now we get to the fun part of Yakima racks. Once you have your towers and crossbars assembled, you can put a legion of different carriers on there. 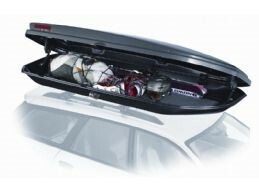 For this winter wonderland, there are ski and snowboard carriers such as the HitchSki. External systems like the Powderhound and Fatcat show off your awesome skis and snowboards, because they won’t mind the weather. But they’re lockable, so envy is all thieves will get. There are also racks for the fairer months. For the water, Yakima offers mounts for surf boards, kayaks, and even canoes. For the trail, there are locking bike mounts of several varieties. Fork mounts require the removal of the front wheel, but offer a low profile. they’re great for taller vehicles. Frame mounts let you leave your front wheel on and feature a swinging arm that grabs onto the frame. Or you could get a wheel and frame mount, which has an extra bracket for the front wheel. Now you’re ready. Three simple stages to prepping your own awesome roof rack. Check out our full line of Yakima stuff today SO YOUR FUTURE SPOUSE WILL ACTUALLY NOTICE YOU. Or maybe just so you can carry your stuff.